If you’ve ever thought, “I wish I had another switch for this bunch of lights,” then you’re not alone. You can actually achieve that functionality by converting a single-switched circuit to a 3-way switched circuit without too much work. 3-way switches allow you to control a circuit from two different locations, and they’re commonly used for lighting to conveniently turn the lights on and off from two different places. 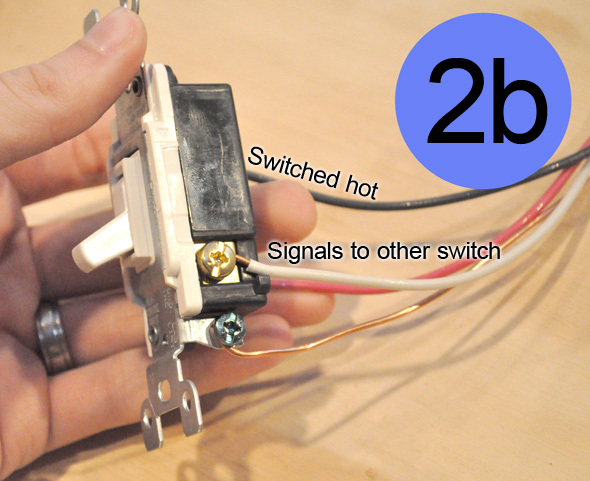 3-way switches are named for the fact that each switch has three hot terminals- two traveler terminals and one common terminal. The traveler terminals are used to interconnect two 3-way switches on the same circuit, and the common terminal supplies (or dumps) power. Rather than off and on, the switch toggles power between the two traveler terminals. Pro-Tip: The common terminal is always a different color than the other two hot terminals. In today’s article, I’m going to show you a common lighting scenario with a single-switch and how to incorporate two 3-way switches. 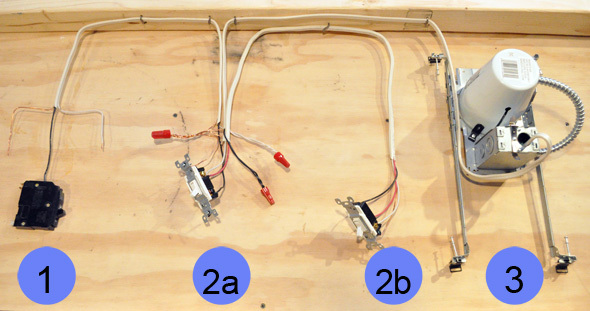 There are actually several ways to install 3-way switches, and here’s a good resource with diagrams to explain alternate options. 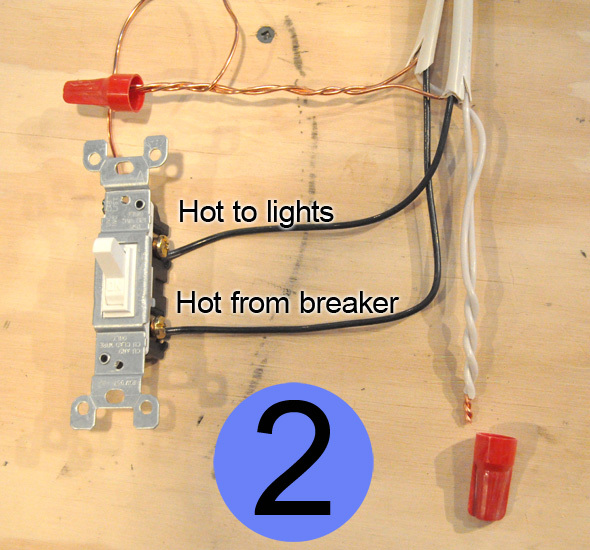 In the tabletop demonstration below, I have 14/2 wire starting at a circuit breaker (position 1) and going to a single-switch (position 2) that controls a bank of recessed lights (position 3). Pretend the breaker is housed within a breaker panel and the switch is in an appropriately sized box. Here’s a closeup of position 2, and you can see that all the copper ground wires are spliced together with a pigtail going to the switch ground screw. The white, neutral wires are spliced and ready for a wire nut to be screwed in place. The black, hot wires are connected to the switch terminals. Pro-Tip: On a single-switch, the hot wires and interchangeable so use a voltmeter to determine which hot wire is supplying power. To install 3-way switches, I need to run 3-wire between the existing switch box and the new switch box. 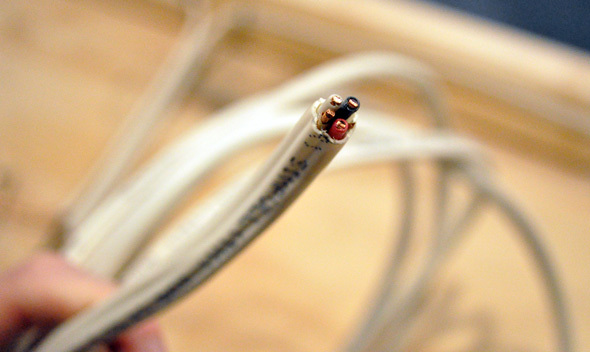 3-wire (pictured below) bundles a hot, neutral, ground and traveler wire together. In the picture below you can see that I’ve run a new 14/3 wire and connected two 3-way switches. 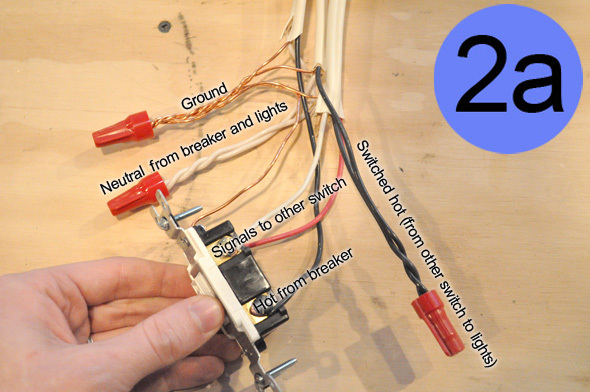 While fishing the wires can be a laborious task, making the proper connections is often more confusing so lets take a closer look at the two new switches. The first switch has three cables coming in- one from the breaker, one going to the lights, and one going to the second switch. Pro-Tip: Identify the white wire as a switch leg by striping it with some electrical tape (not pictured). The second switch is much simpler because there’s one 3-way cable coming into the box. On this switch, the white and red wires are connected to the traveler terminals, the switched-hot wire goes to the common terminal, and the copper wire to the ground screw. A beautiful thing about the OPC workshop is that I can easily test this tabletop demonstration to make sure everything works. As expected, I can turn the light on and off from either switch. Thanks Ethan! Just what I was hoping for. FYI the wireless add on switch seemed like a good solution, but there were some problems with it, namely that for some reason it requires at least one incandescent bulb in the circuit, which they don’t sell anymore. This article will solve my problem though! Don’t be afraid to cut access holes in the drywall in every other stud bay. With a sufficiently large enough hole you can drill studs on either side of the hole. Then use two fish tapes and a strong rare earth magnet to get one tape through the whole run and then pull your wires. Be sure to mark the drywall cutouts so that they can be used as a perfect sized patch. Good tutorial. i have to google this every time I want to wire a new 3-way switch. or a 4 way.. you can just keep running more 3 conductor cable to another switch, the two ends are 3 way, the middle ones are 4 way. and Ethan, please mark your white as hot with a little black tape!! nevermind… you already said that. and I cant edit anymore, sorry. There is one question I have, what about the NEC 2011 404.2 requirement that there is a neutral in each switchbox? I didn’t see anything exempting 3-way switches and there is now no neutral at your new 3-way switch. actually, there COULD be, if you were to use a switch in that box that does need a neutral (lets say lutron maestro) then it wouldnt be using the switch lines as switch lines, but the switch line is just a data line to connect the switches, and then it would have hot and neutral, as well as ground, through that three conductor cable. David, this is a good point and I’m not sure what the answer would be for extending an older circuit, especially since if the switch wire drops down from the light, there would be no neutral wire in the first box either. I’m surprised the code doesn’t exempt one leg of a three way switch…. I guess the solution is that if you have a neutral wire in the first leg (as in this example), you run 14/4 Romex and carry the neutral to the new box, and then nut it off…. I should point out that the reason this happens is because we’re trying to run romex only from one switch box to the new switchbox. If you have the power come in from one side (i.e. switch 1), through switch 2, and then onto the light, you end up with a neutral at each box. Great point David. I’ll investigate this further and report back. I’m a little leery of working with electricity since I saw my brother get shocked real good when I was a kid. I don’t mind doing other projects but this sounds pretty simple to tackle and hopefully will save some time and money. Yeah – as long as you really understand what’s going on, turn the power off, and check your work, electrical work is pretty safe. The house I just moved in has this in a hallway and I need to replace one of them and this info is jkust in time. this is perhaps the most helpful project thus far! combo this with your drywall patch tutorial and bingo, done deal! Thank you soooo much! I finally understand how this works, and I set up my first working 3-way switch in the basement! Great Point David ! I finally understand how this works, and I set up my first working 3-way. Thanks a lot for the detailed pictures.. exactly how i need it! Your blog posts always stand beyond the standards. I didn’t know we can Convert a Regular-Switched Circuit to a 3-Way switch. Anyway thanks for the ideas which you shared here. Let me just start by saying that my house was obviously not built by professionals… I have a light that has two switches already controlling it, but both have to be on for the light to work. I thought they both just needed a 3 way switch. When I went to replace the switches I found that there was only one black wire, along with one white and one ground. What would I need to do to make these work? I now understand how to go from a switch leg to a three way switch.